The Kerbal Geogeographic Society (KGS) and the Maritime Exploitation Institute (MEI) are seeking enthusiastic Kerbals to join in the exploration of the coasts and waterways of Kerbin. As a part of Global Geophysical Initiative, Kerbals are encouraged to abandon their planes, rovers, and rockets, and embrace the hydrosphere. To promote the exploration of Kerbin's coasts, the KGS and MEI announce a series of challenges/contests. There can be only one top record holder, but through your efforts, you can help name coastal features of Kerbin. No mods that add parts or alter physical performance of stock mods. No mods that alter the game physics. MechJeb, Hyperedit, and other non-performance changing mods are allowed. Build a boat using stock parts. Power your boat using stock engines (see Scoring Levels below). Start from near the Kerbal Space Center (I have been using Hyperedit to get my boats into the water just east of the runway). Report or show your starting latitude/longitude. Travel to a location on the coast. Plant a flag and name the location. Report of show the latitude/longitude of the site you named. Take a screenshot for the history books. Either continue on your voyage to name more locations or return to the location you started from. If you can't return to your starting point using the same craft, with all of your crew, it doesn't count. Remember the Maritime Exploration Institute's attempt to change its image after the disastrous pleasure cruise last year: No Kerbal Left Behind. To be clear, you can plant multiple flags during a voyage. The maximum number of flags you can place during a given voyage is determined by the number of kerbals onboard your vessel. Ten kerbals? Ten possible flags...and you get to name all those locations. Take a screen shot showing mission clock. Oh, and no refueling. The fuel you leave the KSC with is the only fuel you have. Coolness++ if you go into detail about your ship and its journey. Each entry will be cataloged and added to a downloadable file compatible with MechJeb or WaypointManager, allowing other intrepid explorers to more easily navigate to the place you named. Scoring is fairly straight forward. A detail: the distance reported by the F3 info screen is often incorrect. To get the distance, either a "Great Circle" calculation will be made using the start and flag lat/long info, or a round trip will be calculated using Kerbal Earth. Short video tutorial showing how to use Google Earth with maps of Kerbin. Level 2 "Wheesley", "Panther", "Whiplash", "Dart", and "Juno"
Level 3 "Goliath", "Wheesley", "Panther", "Whiplash", "Dart", and "Juno"
That's right: Kerbals are a score multiplier. The MEI wants Kerbalkind to start exploiting the waters of Kerbin, not just engage in "flags and footprints". Kerbal Maps is down, maybe for good. Copy is available on the Internet Archive, or can us downloaded. Links in this thread. If you find that jet engines are producing too much "fog" in KSP 1.2, a suggested solution is here. Download available here. Using (and sharing) Spaceplane "waypoints"
When the Kerbal Geographic Society(KGS) and the Maritime Exploitation Institute(MEI) made a joint announcement that they would be promoting the exploration and utilization of the coasts of Kerbin, Ditrid Kerman saw an opportunity. Though he was a pilot for the Kerbal Space Program(KSP), he had received a Masters degree in entomology. Ditrid was particularly interested in the captive breeding program of the unusual Tree Lobster. Native to Lobrat Songnal Island--the southeastern most island off the coast of Kerbal Space Command--the adults can grow to 15cm in length and live on the steep sides of the island. The juveniles spend their time exclusively on the shores, however, feeding on phytoplankton and algae. It’s only once the juveniles reach their final molting that they lose the ability to skim over the surface of the water. Unfortunately there was a massive spill of mystery goo off the coast of Lobrat Songnal, and the Tree Lobster was thought to have been driven to extinction. A breeding colony of 12 individuals was rediscovered five years ago, and through intensive care on the part of entomologists at the Wildlife Tribulation Foundation (W.T.F), the numbers of the insect in captivity are over 500. More importantly to Ditrid, the W.T.F was planning on reintroducing individuals from captivity to the island. Collaborating with Jeb, Ditrid was able to design a hydrofoil who’s shape was inspired by the Tree Lobster. After initial shakedown cruises where they were able to work out optimal speeds and what the maximal range of the boat was, Ditrid was thrilled to see that Lobrat Songnal with within the estimated range. Once cleared, Ditrid, her co-pilot Genested, and eight other excited scientists and engineers set out with W.T.F's blessing to reintroduce the Tree Lobster to their native island. Upon returning to the KSC, Jeb was eager to hear about how the ship performed in its first real voyage. Both Ditrid and Genested agreed that the cockpit needed a better view. Very interesting! I'm not sure which ship I'm going to pick for the journey. The maps are downloading, after that I'll try to figure out how to import them into Google Earth. Check out the youtube video I put up showing how to do it. You should rename the challenge to biggest speedboat or something like that. As the scoring (speed * kerbals) have nothing to do with distance. I admit that maybe the scoring formula can be improved. I'm personally much less interested in the score than I am in building a boat able to travel long distances and then naming the places I visit. And then sharing a file with other players with the names and locations that they can add to. I believe there are enough speedboat challenges. This is definitely more geared toward exploration than rushing to a destination. The score is just there for people interested in such things. If you have a suggestion on a different scoring formula, I'm open to alterations. EDIT: I'm also pretty certain that, as we start to see larger craft made to go further distances, the tradeoffs between the amount of fuel needed and speed will come into play. My hope is we'll see some interesting solutions to finding optimal speeds in relation to massive craft. Let's say you want to travel 500,000m from the KSC by boat, plant a flag, and make it back without refueling. That's a lot of fuel. You want something that will give you the highest speed with the least fuel usage. It's a tricky thing to work out. The idea of planting one flag and travel back means it's very time consuming and not very inviting to repeat many times. May I suggest something different: amount of crew places (not actual members) divided by 10 = the amount of flags you can plant before going home. Also a minimum distance between flags (let's say 200 km). You want a cruise ship, you'll have a cruise ship. Maybe point 12 in the rules should be changed to make it clear that you don't _have_to return to start after planting 1 flag? For example, I could plant as many flags as I want on my trip as long as I get back to my starting point. It wasn't my intent to mean you could plant only 1 flag per run...it just ended up being written that way. I'm going to go ahead and change how that is written now. EDIT: Revised the rules a bit to better reflect the idea that you can plant multiple flags, and tied the max number of flags to the crew size. I thought about the crew/#=flags idea. I like it, but stopping to plant flags is time consuming, so if a player stops a lot to plant flags, their time increases and will impact their score. Obviously no game balancing has been done with the idea here, so for now let's just roll wth #crew=#flags and see what happens in play. As for a minimum distance between flags, I think a minimum distance might need a scale for the score level. My Level 1 ("Juno" engines only) example entry can only travel ~55km before it has to turn around and come home. I can also imagine (I say imagine, but I have missions planned) that some of the flags will be navigation waypoints along the coast. Regardless of the distance to a different flag, that marker might be really important for more efficient navigation in future missions. 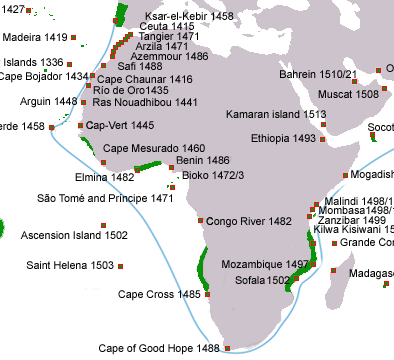 We're the Portuguese navigators in the 1400s creeping down the coast of Africa, making maps to make it easier for the people that follow us. you can divide time/flags n°.. in that way you have an average time needed to move to a place and place a flag..
so if it take 3 hours to plant 1 flag it's different than planting 10 flags in the same time..
in this way it becomes (somehow) a matter of efficiency instead of speed..
you can also decide to take in consideration fuel needed..
total distance(meters) / (total time(minutes)/flags) * (fuel consumed/flags). and then add some additional bonus..
for example, going back safe to ksc can be a plus..
placing an automated colony or a radio beacon instead of a flag can also be a plus and add some points..
moving to a different continent than ksc's can also have bonusses.. I've been messing with some scoring options involving flags. I came up with some (I think) cool scoring methods that take distance between flags into account, but the math involved in calculating distances between flags from lat/long isn't trivial. It might make a good scoring system in a game, but not in a challenge. I guess when you need a spreadsheet of some python to calculate a score, it's probably not a good method for here. In some tests, going a long way and placing 1 flag gives a better score than going a short distance and placing a lot of flags. Imagine a boat that travels ~340,000m total and plants 10 flags in 49min. That boat would get a score of ~21. If that boat traveled double that distance to ~680,000m in double the time (1hr 38min) and plants 1 flag, their score would be ~23. So in ecological terms, you can have an r vs K strategy. You can invest all your effort into going far and planting very few flags, or you can travel short distances and spam. Unfortunately the score doesn't punish people for putting 100 flags all in the same spot. After the public-relations coup of reintroducing the Tree Lobsters to Lobrat Songnal, the Maritime Exploitation Institute(MEI) wanted to use the public attention and encouraged another trip of The Skutaliepooper. Ditrid was initially hesitant to sign on, mumbling that it's not the Kerbal Sea Program, but when Jebediah asked to come along during the next voyage she knew something was going on. In fact, Valentina and Bill asked to come along. Suspicious, Ditrid asked what was up. "Well, you and Genested had both said the view from the cockpit was terrible. And Genested mentioned that it was a bit of a pig to turn. I just thought it would be useful to see the problems up close." "Ok. I can understand Bill wanting to check things out. He's an engineer. Whenever you and Valentina are both interested in something.... Remember that chess playing golem you two tried to build." "IT PLAYED TO WIN! But that's not the point. Come on, I even marked out some locations that would be good navigation aids." "What's point D? It's outside our range. And what's this other line?" "What-nothing-shutup. Coooome ooon. Pleeeeease let me come. I'll plant the flags so you can stay dry." Still suspicious, Ditrid agreed. After all, Jebediah had worked out some good locations that were within their range. From the start, Jebediah agreed that the view out the cockpit wasn't great. After getting Bill to come up and see, Bill went aft to confer with Tiya about the problem. "I'm sure Bill will come up with a solution. He had some good ideas about the golem playing the piano." While unoriginal, "SE Corner of KSC Peninsula" was descriptive and functional. "Well, we have to turn here, and the water is clear." "Maybe try harder on names." "Oh whatever. It's better than Old Orchard Beach or something like that. " As they returned the the KSC, Jeb's excitement grew. Upon reaching the beach he leapt from his chair, ran aft to talk with Valentina. They quickly disembarked, leaving Ditrid with the memory of point D on the map and a sense of unease. That is one pretty boat. I'm looking forward to your official entry. Do you have any sense what the range on the Dooblydoo is? Edit: the inclusion of the dockable runabout is great! Makes me want to try that on some of my upcoming entries. I have made all the boats I have used in previous challenges, and my most recent Skutaliepooper, available for people to download, use, or build off of. They are in the github repository I set to keep all these files. I edited the OP to include all the links. But seriously, go ahead and use my craft files. If you just want to go name places, grab a ship and go. As I improve on my ship designs I'll add them to what's available. If you're sure you won't see what she can do, I can put the craft file up on github for people to play with. Heck, once nav points are officially placed, I might test it out and see how close my guess on its range it. After their return from the The Skutaliepooper's official mission for the Maritime Exploitation Institute(MEI), Jeb and Val disappeared into their work room (which was really just a storage area they had taped a sign reading 'WICKED AWESOME SHOP' onto). After a few days, Jeb and Val ran up to Ditrid and grabbed her arms. "We fixed your boat problems!" "And the turning is better. We used some Wheesley engines and the reverse thrust makes it waaay better!" "Oh! And we're pretty sure we more than doubled the range!" All the while they were urging her to walk to the shore, where they unveiled The Kitty Wine. Unlike The Skutaliepooper's design, The Kitty Wine looked more like they used what was available. It still used the water skimming legs inspired by the Tree Lobster insect, but the body was thrown together. "Yeah! It's yuge, so we thought it'd go far." "But we took the oxidizer out. Who needs that in a boat?!!" "And it has two control pods...."
"Wicked cool, right? Only one of them has a good view." "But why two? Why not just the one with the better view?" "Two is better! This is better than the chess golem! This boat plays to win!" "We can't have nice things, can we. To her surprise, the crew roster filled quickly. It seemed the Kerbal scientists were anxious to actually go places. As the got underway, Ditrid had to admit the view from the second command pod was much better. During their trip south along the coast, they stopped once to place a navigation marker for the MEI on what Wencee described as an "interesting example of a collapsed wave-cut platform." Though The Kitty Wine had increased range, had improved visibility, and had much better maneuverability thanks to the ability to reverse the thrust of the engines, several of the scientists on board noted that it would be useful to have a large cargo area for transporting research materials. Maybe even smaller water craft or short-range buggy. After placing their flag on the peninsula commonly called "The Leg", Val was unusually silent. When asked if everything was ok she simply said that she'd never really seen the wider ocean to the west before. "I mean, I've seen it from the air, and from orbit, but not from ground level. It's just...compelling...."
I spent some time this morning modifying the code to this so it would read the locations of structures placed by KerbinSide and generate a kml file of their locations that I could use with my Kerbin Earth. I'm adding the file to the github in the "downloads" directory. Something that became clear looking at the locations of some of the coastal KerbinSide things are not in great places for people going long distance. Take Hanbert Cape and South Point, for example. The red pins are location I will have to change course a bit. Both are out of my way...which is a shame since it'd be pretty cool to be able to refuel at those locations. In some of the naval circumnavigation(@The_Rocketeer) attempts I have read, it seems like this strait is a location people tend to need to refuel. Seems to me that points L or M would make great locations for a static refueling dock. I'll probably wait until Wed(earliest) to post the Voyages of the Western Nosebleed to give anyone else interested a chance to head out and name things. Remember, if you don't want to build a ship but want to head out and name places, my ships are available for people to use. I installed KerbinSide/KerbalKonstructs and I'm going to respect the names of places provided by KerbinSide/KerbalKonstructs. Not much of an issue for this mission, but I do use one of the structures to reveal something new inspired by @DoctorDavinci's HMCS Dooblydoo. The markers for The Leg and the SE Corner of KSC Peninsula worked well when travelling south, but were not positioned well when travelling north. I made some minor adjustments to their lat/long locations in the WaypointManager and MechJeb files. I also made a kml file for use with the Google Earth/Kerbin stuff. Valenina was obsessed. Seeing the ocean spread out before here like that filled her with the same desire as looking up at the stars did. Luckily, the Maritime Exploitation Institute(MEI) was so pleased with the craft that had sent out and areas marked that they provided funds to build a craft that would double the range of the Kitty Wine. Val and Bill began to collaborate on a new craft, taking what they had learn previously, but also keeping in mind that the scientists on the Kitty Wine's first voyage thought that inclusion of a small runabout would be a good idea. After a month of design and testing, Val was ready to unveil the newest craft: The Western Nosebleed. Testing indicated that the range of the Western Nosebleed would be ~4.8x that of the Kitty Wine. The Oceanbug was designed as a short-range (~40km) runabout that would make it easier for the crew to get to shore. No more swimming to place markers! After successful docking of the Oceanbug in the hold of the Nosebleed, Valentina gave Ditrid the controls. Ditrid knew the course down the coast, and Val wanted to rest for when she would take over later. Traveling down the coast went without trouble, and the Nosebleed was able to reach the southern cape after an hour of travel and without incident. Val took the Oceanbug out to get navigation data and place a marker: Cape Vista. Docking again with the Nosebleed, Val took the controls and set out into the ocean to the west. As they lost sight of Cape Vista, the immensity of the ocean began to become clear. After another hour and 45 minutes, the Nosebleed reached it's destination: Seanth's Landing, named after a mythical account of a circumnavigation. Ditrid took the Oceanbug out to place a navigation marker on the south shore of Seanth's Landing, and after conferring with Bill about the expected performance of the craft, decided to give it a full test and place a navigation marker at the north shore of Seanth's Landing as well. Unknown to Ditrid, Val had transferred all the waste materials into the Oceanbug's holding tanks. After Ditrid had left. Clauenna jokingly said maybe a better name for the Oceanbug would be The Poopadescooter. After getting the hang of how to pilot the tiny craft, the Oceanbug was deemed serviceable, but hard to pilot. After redocking, Bill admitted that the design was limited by the amount of space available in the cargo area. "Obviously if we had more space, we could include a large runabout. Maybe even more than one." As they were preparing to to return to the KSC, disaster! Jeb rushed forward, distraught: "We ran out of snacks! No more Koylent! And no more water!" Raised voices and finger pointing and accusations of poor planning and questions about the virtues of mothers were exchanged, but everyone realized the only solution was to quit complaining and head home. It wouldn't be a comfortable 3 hours back, but no one would starve or die from lack of water. Valentina took a much needed rest as Jeb took the controls and was able to easily navigate back to the KSC in the night thanks to the navigation markers that had previously been put out. Hungry and thirsty, the crew was wowed by a dawn eclipse, but agreed that future improvements needed to include additional food, more cargo room, and ideally an improved runabout craft. I may do a level 2 or level 3 ship. Also considering a level 1, but I would need to research it a bit first. Hmm.. Having significant trouble getting my hydroplanes to actually plane. I think there is pretty much a "coffin corner" like effect where hydroplane boats need a minimum TWR for hydrofoils to be of any significant benefit. It took some work, but I was definitely able to see improvements in fuel usage with the tiny little jet engine. You are completely correct about needing a minimum TWR ratio, though. Once you can get up on planes, though, you can dial back the throttle (sometimes quite a bit). Feel free to download and look at the ships I put on github. Either use them as-is, or improve on them. The Skutaliepooper was put together just so I could have an entry using the Juno engines. I built it, got it up on planes, and went with it without trying to refine it other than learning how to pilot it (in the video, you can see I crash it into the surface a few times as I'm getting used to it). I'm positive there is a lot of room for improvement. Huh. I just looked at the performance of the crappy little runabout I made for the Western Nosebleed. The Oceanbug has a range of ~40,000m and a cruising speed of ~26m/s. That comes out to a travel time of ~1500sec. If you threw 1 kerbal in, traveled 20km, planted a flag and came back, the score would be 26.67... which is much better than my Level 1 score. 40km isn't great--I'm not sure you could get to the runway island and back--but certainly hints that much better Level 1 craft are possible. 100km round trip puts you in range of all the islands near the KSC.